Since Apple launched its revolutionary AirPods back in December 2016, there has been a steady stream of truly wireless in-ear headphones from a host of manufacturers, including B&O, Bose, Motorola, Onkyo and Sony. And we even have 2nd-gen AirPods. All have added a slightly different twist, brought different sets of features, and had varying degrees of success with their earbuds. But what about Sennheiser? The headphone giant has been observing quietly from the sidelines like a waistcoat-clad Gareth Southgate, scouting out rivals and fervently making notes as it plans how to approach this particular headphone category. Now the time has come for the Sennheiser Momentum True Wirelesses to make their world debut. But will they play a blinder, or end up sidelined on the bench? If there’s a feature you want from your wireless earbuds, the Momentum True Wireless probably have it. The spec list is so long it’s hard to know where to start. Battery life is a decent four hours, which compares to a three hours on the Sony WF-1000X and five from the capable Bose SoundSport Free. 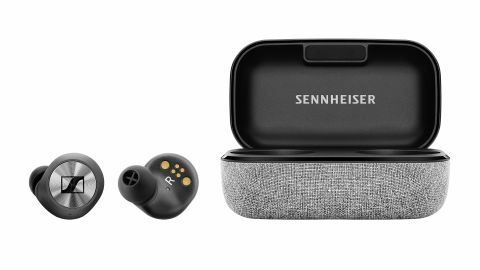 As is the trend, the Sennheiser wireless earbuds come with their own carry case that doubles as a docking and charging station. This compact, fabric covered box charges via USB-C, with the earpieces dropping into secure magnetic slots where they start charging via their gold contacts. The pairing process for these wireless in-ear headphones starts as soon as you remove them from the case. They’re immediately discoverable, and if you ever need to pair them with another device, simply press and hold on the outside of both earpieces to restart the process. A small LED light on the rear indicates the level of charge in the box – green for more than 50 percent, yellow for less than 50 percent and red for empty. It’s a small detail, but handy for quickly checking if you have enough juice to charge them. At full capacity, the case provides enough power for two additional charges, which amounts to a total of 12 hours of battery life. The headphones need roughly an hour and a half of charging to reach full power from empty. With some wireless in-ears, it’s difficult to monitor how much charge is left, but that’s not the case with the Sennheiser Momentum True Wireless. If you power up the Sennheiser Smart Control app (compatible with iOS 11.0 and above and Android 7 and above) you can see an exact percentage of power remaining in each earpiece. This attention to detail means you should never get caught out. The Sennheisers’ armoury includes what it describes as ‘two-mic beamforming’ which it claims improves the audibility of your chat during phone calls. They also prefer noise isolation to noise-cancellation and do a good job of blocking out all the various rumblings on the daily commute. If you’d prefer to hear more of what’s going on around you, turn on the Transparent Hearing feature, either by selecting it in the app, or double tapping on the surface of the right earpiece. You can set it so the headphones either stop playing or continue to play when activated. It works fine with the former setting, but its effectiveness with the latter depends on your music – the louder it is, the less the feature works. Imagine trying to put a Rolo in your ear – that’s how it feels manoeuvring the small round earpieces into place. We find short listening bursts of up to an hour fine, but they are occasionally a little uncomfortable over a prolonged period. The Momentum True Wirelesses boast a clean, uncluttered look with not a single button in sight. Sennheiser has achieved this by turning the metallic rings on the exterior surface of the buds into touch sensitive buttons. Very clever. The left ring controls playback, with a single tap to play and pause, a double tap to skip forward and a triple tap to skip backwards. A long press and hold will turn the volume down, while doing the same on the right ring bumps the volume up. A single tap on the right brings your virtual voice assistant (Google or Siri) to life, while a double press enables or disables the Transparent Hearing feature. Having all these controls at your fingertips sounds great in theory, but the reality is a little different. Playing, pausing and changing volume work well enough. The headphones react quickly and the volume doesn’t jump up and down unpredictably. Issues arise when you want to skip tracks and activate the Transparent Hearing mode. It’s quite tricky to nail multiple taps, and if your finger doesn’t quite hit the spot you’ll find yourself pausing when you want to skip forward or skipping forward when you want to skip back. We also found ourselves activating Siri on a number of occasions when we were trying to turn the Transparent Hearing on and off. Sennheiser’s Smart Pause feature means that you can just remove one earpiece and music will automatically stop. Put the earpiece back and your music picks up again. Again, this is a neat feature we haven’t come across in truly wireless in-ears before. The only issue is if you take them both out and place them near one another the music starts playing again. You need to keep them a certain distance apart. So the execution isn’t perfect, but we admire Sennheiser’s ambition. We just hope the sound quality hasn’t taken a back seat – after all, these headphones are part of hugely successful Momentum range. This entry was posted in Blog and tagged Sennheiser.